5:00 comes early. Rising like Lazarus from the dead of sleep to a cold, high-alpine morning is tough to get used to, no matter how often we do it. 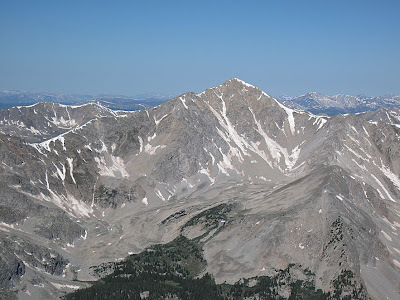 Missouri Mountain is a Sawatch Range anomaly. 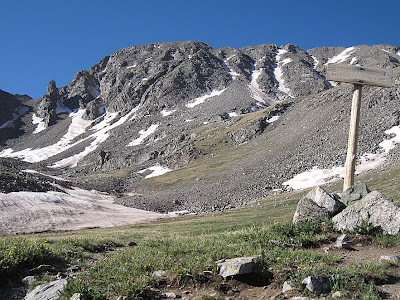 In a range dominated by mountains that, though undeniably massive, amount to little more than gently sloped mounds of grassy fields and scree, Missouri Mountain is a rugged crag and a surprisingly challenging climb. It is even challenging to determine which of the many points on Missouri's jagged ridge is the actual summit. 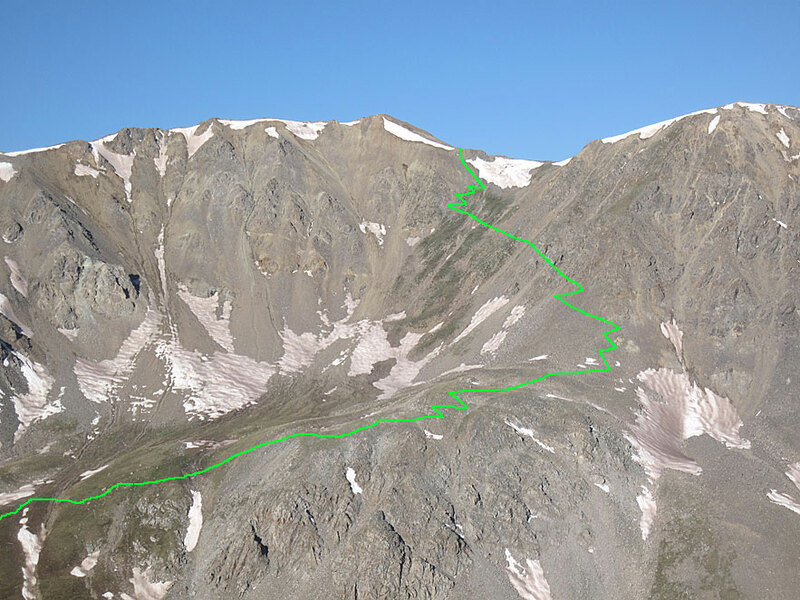 The Missouri Gulch trailhead, our launching pad, was very close to our basecamp, so after a quick breakfast we arrived just after 5:30 am. 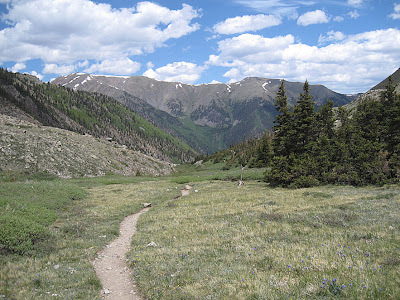 We strapped on our boots, yawned a good half-million times, and set out up the beautiful trail towards Missouri Gulch. The trail starts off right away climbing steeply up a series of switchbacks through a lush growth of trees. 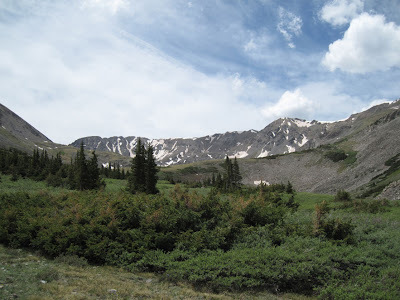 After only a few switchbacks, we were passed by a man running up the trail! People of all sorts, unimpressive and impressive, climb fourteeners. An hour into the climb we came upon a tent city and a rather large group of people who were camped just below treeline. This gave us the idea that when we returned to the basin to climb Belford/Oxford in two more days we could backpack to here to lessen the length and elevation of that notoriously long climb. 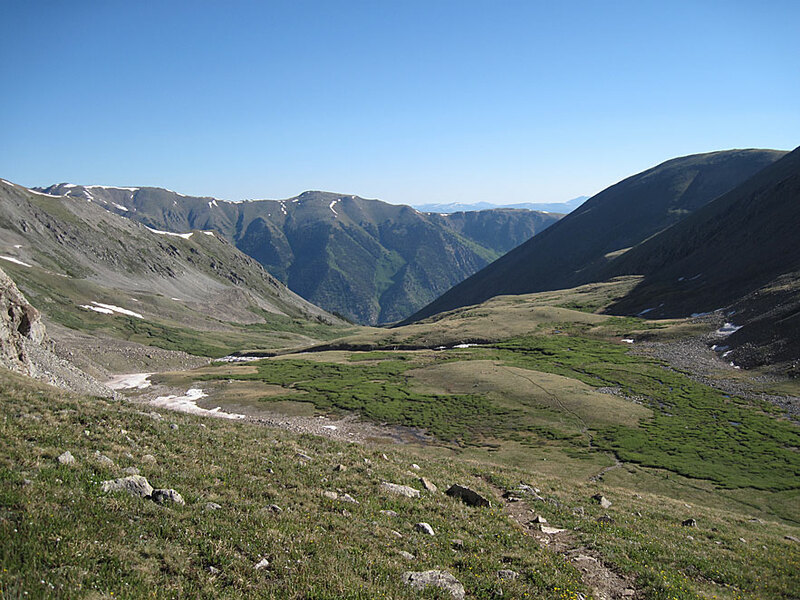 The next portion of the route took us through a long, broad meadow at the top of Missouri Gulch. 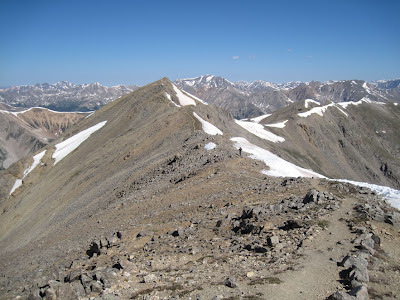 Missouri Mountain appeared on the horizon and seemed to rise tectonically as we crested the hill on approach. 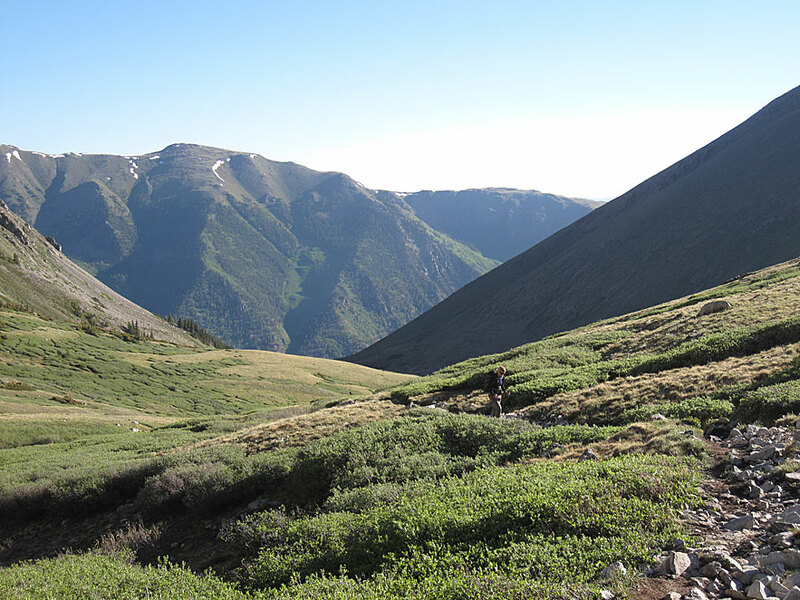 We tiptoed back and forth across Missouri Gulch Creek as the jagged bastions of Missouri's north face grew before us. At 12,700' the we turned west and faced the most challenging portion of the ascent to Missouri's summit: a tough scramble up loose scree with exposure. After some difficult and treacherous loose rock, we reached Missouri's northwest ridge. The half-mile traverse to the summit was airy and exciting with two sections of knife-edge tight roping across snowdrifts, and one downclimb that required both hands and feet. Great focus was required for each movement, which helped distract us from the intense exhaustion of a long day. 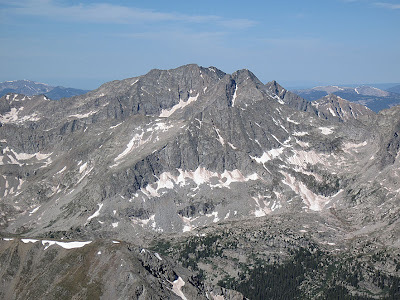 When we reached Missouri's summit, I was coming down with a mild case of altitude sickness (dizziness, disorientation), so we did not linger very long. The views from this incredible perch, however, were astounding. The hike out was long, exhausting, and bone jarring. Ominous towers of clouds were building on the western horizon, and we had one peculiar encounter with yet another member of the I-shouldn't-climb-mountains crowd: a woman dressed only in tiny biking shorts and a sports bra. She was carrying no water, had no protection from inclement weather, and had such a deep sunburn her skin bore a striking resemblance to the skin of a tomato. We considered offering her sunscreen but decided that enjoying a second-degree sunburn, and an exacerbated chance at skin cancer, was her prerogative. I suppose she didn't understand how much less ozone there is protecting you from UV above 13,000'. Is there still a shell of a log cabin near the treeline? Thanks!